Since I was going to be home late, I wanted something easy for dinner like beef burritos. I asked Alexis to swing by the store for tortillas so I wouldn't have to make them. "You know, while you're there, pick up some taco seasoning too," I added driving on the curvy salt laden highway, "I don't feel like making that either." "Might as well pick up packaged Mexican rice, too," I went on and then laughed "Dang, I'm not actually making anything, I should just have you drive through Taco-Bell and order 4 beef burritos!" 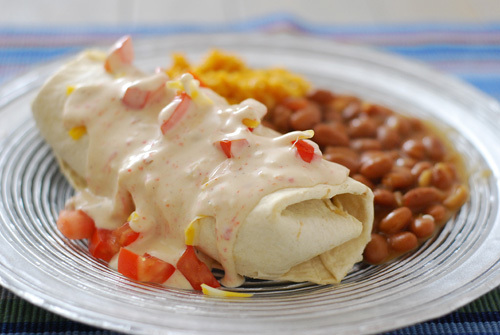 As I was making the burritos I decided I wanted a spicy cream sauce, so I made that and a side of pinto beans. So for my "quick and easy" dinner, it took almost an hour and I STILL managed to mess up 4 pots and a bunch of accessories. Sigh. I am finally going to do a brisket post. Someone mentioned that I have never posted about that although I have shown the results. I have a brisket in the fridge that I'll be cooking either tonight or tomorrow. My brisket process is backyard style (not comp) and based on Chris Lilly's with other influences and an injection. I hope to have that post up maybe as early as Sunday.